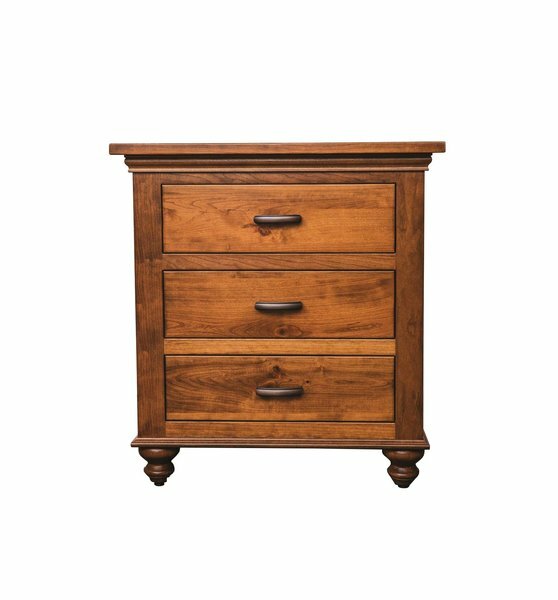 Gorgeous in any decor, our handcrafted Sunbury Three Drawer Nightstand offers good looks, ample storage, and the natural beauty of solid hardwood for anyone to enjoy. The first impression of this nightstand is one of robust storage. The large solid wood top is convenient for housing your most needed bedside items. The beautiful decorative molding leads you down to three flush-mounted, flat-front drawers that provide plenty of additional storage for any other necessity you may need for the night ahead. Open each drawer to reveal a solid dovetailed drawer box, fixed to the case with side-mounted, full-extension slides that all the drawer to completely extend, giving you plenty of access to the contents inside. Finished up with a detailed base molding and four large ball feet, this nightstand is sure to hold its position on any surface. Built to order, you can customize this nightstand to match any bedroom decor you choose. Start with your choice of nine different hardwoods for the construction of this nightstand. Each hardwood offers an array of hand-applied stain options to choose from, offering complete control of the final look. Finish it off with the hardwood as shown, or select a different collection to add the finish touches. While we strive to provide the best options we can, we also understand that some pieces are almost exactly what you're looking for, with a few exceptions. Spending years working closely with the woodshops that construct this beautiful furniture has allowed us to develop the know-how when it comes to custom furniture. If you needed something altered, removed, expanded, or shortened, please call one of our Furniture Experts today to discuss your options. We're happy to provide a free custom quote for the exact nightstand you need.